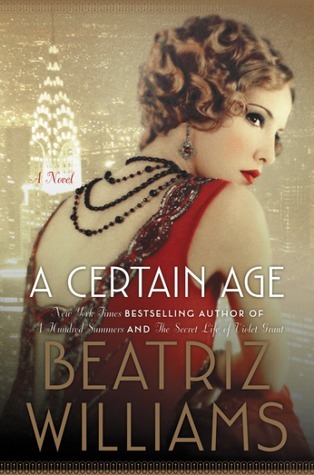 What They Say.....The bestselling author of A Hundred Summers, brings the Roaring Twenties brilliantly to life in this enchanting and compulsively readable tale of intrigue, romance, and scandal in New York Society, brimming with lush atmosphere, striking characters, and irresistible charm. What I Say......Okay, so I freely admit I'm a Beatriz Williams fan. I couldn't put down A Hundred Summers. It was one of my favorites. This one started out a little slower, with a reporter providing the setup for the story, but with an old radio type voice. A man is on trial for murder and the courtroom is filled with spectators and interested family and friends. Theresa is a rich society woman of a certain age, who has begun a passionate affair with a young soldier just back from the war. I will say that the constant reference to Octavio as "The Boy" was an irritant from the beginning. I felt like it actually made the character less relatable, and made me not as invested in his story. Theresa's brother decides to send a "cavalier" to propose to the young heiress, Sophie, rather than do it himself. Theresa volunteers her "Boy" for the task, but instead of creating a happy marriage, the cavalier falls in love with Sophie himself. As Theresa tries to compete in the same ring as beautiful, young Sophie, a mystery surfaces. I don't want to give any spoilers, but some of the twists seem very far reaching. I think I may be more of WWII fan than WWI - is that possible? It doesn't seem like it should make that much of a difference, but maybe that's the key.